There comes a time in every musician’s life when he or she must face life’s tough facts. For some, it’s a question of continuing. Some decide to persevere despite diminishing returns and hope for the best. Others decide to change their plan of attack. Whatever they’re best known for, the pair’s tireless touring and recording schedule means that the Girls have amassed a solid cult following since forming in the late ’80s and now routinely play larger clubs and theaters around the country. And yet, their most recent recordings suggest the pair doesn’t seem satisfied with just being a nostalgia act. The Girls’ new album, “Poseidon And The Bitter Bug,” is surprisingly strong, commercial collection from two middle-aged bards and it’s a disc that leans more in the rock vein than many would anticipate. It also demonstrates that while the twosome’s popularity might have passed its zenith, they’re certainly not going out quietly. 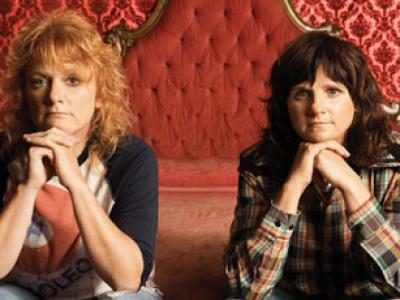 The new record, which is the duo’s 11th disc, heralds a new phase for the Indigo Girls. The two were unceremoniously dumped from Disney’s Hollywood Records in 2007, forcing the pair to turn to indie label Vanguard Records to release this album. More importantly, “Poseidon” also solidifies the commercial direction the duo have pursued in recent years — at least as saleable as acoustic guitar music can be in the age of Auto-Tune, digital samplers and iPods. Their last LP, “Despite Our Differences,” had an unexpected pop-music slant to it and featured the incongruous guest appearance by Pink. While that album was evidence enough that the two finally seemed reenergized to play again, it was too abrupt of a makeover. The legacy that enshrines the Indigo Girls as inspiration for younger generations of female performers like Crow or Ani Defranco and feminist trailblazers for their perennial appearances on the long-shuttered Lilith Fair is a history that can’t be ignored. It couldn’t be expunged with just one album without furrowing some brows. The new record skirts rock, pop and country influences and is less emphatic about being different. The duo maintains the full-band arrangements and feistier attitude glimpsed on “Differences,” but curtail the sonic extremes. The album’s opening cuts clearly signal that this record isn’t interested in churning out pseudo-Woody Guthrie material to get a rally going. The slinky, acoustic-guitar plucking and Saliers’s fetching vocals on “Digging For Your Dream” trick the ear into thinking we’re hearing the newest Aimee Mann track. Her’s and Ray’s vocal harmonies are used more as layers, sometimes slightly staggered, as opposed to just singing in unison. It’s a curveball and one that suits this mood and makes for a more intoxicating entry into the record. When it’s Ray’s turn to front a song, her “Sugar Tongue” is even further afield from Indigo Girls’ usual musical preferences. It has an exotic, almost flamenco rhythm to it and allows electric piano and electric guitar chops to lace through the melody. With her guitar providing a little rhythmic ballast in the tune, Ray focuses on singing in a lower register, sounding more like a whimsical cabaret crooner than the veteran she is. Some songs come across like Ray and Salier are producing high-class demos for other artists. While the buoyant “Love Of Our Lives” has the pair returning to their trusty harmonies and acoustic strumming, the cut has a cheerful energy that Crow could easily latch onto. “What Are You Like” is a peppy, R.E.M.-ish rocker, but an oscillating effect that whines in the background during the chorus suggests this would be ideal for Gwen Stefani when decides to ditch life as the glam queen. Other songs seem to grow out of the duo’s listening habits when they were kids. “Second Time Around” takes Bob Dylan’s “Tangled Up In Blue,” slows the tempo to a country stroll and adds a mandolin, a banjo and a little “Blonde On Blonde”-era organ to create a mountain-music romp. A little harmonica break underlines the Dylan comparisons, but it’s still one of the record’s most pleasing moments. The same could be said for “Ghost Of The Gang,” which features the identical drum pattern and the hollow-sounding guitar bark as those employed on the Rolling Stones’ late ’70s gem, “Shattered.” Ray and Saliers’ harmonies brighten the melody and give it a true hook you can’t easily shake off. The same holds true for the contributions of ace session drummer Matt Chamberlin, who might be channeling Charlie Watts at his best, but also gives this ditty great potential as a single. Obscured beneath the stylistic dabbling is the real emotional tones both women seem determined to hit. Some lyrics offer imagery that delves into people bearing and baring hidden pains. The disc’s stripped-back tracks, however, give the best opportunities to glimpse the raw feelings the Girls attack. “I’ll Change” is a James Taylor paean that glows with a gorgeous middle third. “Fleet Of Hope” is a nautical-themed story song whose central character is a supersensitive, very reflective fisherman apparently drowning. and yet lets himself slip away, his last visions overcome with beauty. Don’t go toward the light, Captain! Keep away from the light! Ray leads the album’s finale with a Jeff Buckley-style power ballad, “True Romantic.” Her country crowing yaps each verse alone, only bolstered by some guitar lines and piano chords as the intensity picks up. When some pounding drums kick in, Ray unveils a full wail that pointedly takes on a tormenting lover and lets him/her know she isn’t going anywhere. Finally, here’s an Indigo Girls song we can imagine all the emo belters on “American Idol” claiming as their own. Whether it’s the next folkie oddball on “Idol” or the struggling songsmith playing at your local neighborhood coffeehouse, “Poseidon And The Bitter Bug” has the kind of pop smarts to instantly appeal to the next generation just as it ensures the Indigo Girls aren’t playing casinos for the near future. More than that, the record is evidence that the Girls aren’t letting their status overwhelm them. They’re still hungry in the way that they were back in the ’80s, but now it’s for something completely different. They want to be relevant and that usually the deciding factor for any musicians’ continued success. If no one is listening, why bother? Tags: "Poseidon And The Bitter Bug", Amy Ray, Emily Saliers, Indigo Girls, review. Bookmark the permalink.